I have nothing new for my 2nd Anniversary so KiLL! 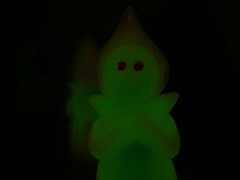 has put up some custom Flatty the Flatwoods Monsters I did for him at his webstore. GID vinyl with Metallic Pink and Blue spray.